The heart of Corsica beats in Corte. Booking a hotel is one of the most important aspects to settle before travelling. The Hôtel du Nord is the perfect option for your stay! The Hôtel du Nord opens all year round to meet your expectations, please be aware that booking beforehand is highly recommended! We would be delighted to have you as a guest in one of our comfortable rooms, entirely renovated without losing its charm. The rooms are equipped with everything you need to ensure a comfortable stay. Besides our different room types, we also have conference rooms. Book in advance, whether your visit is a family holiday or a business trip! 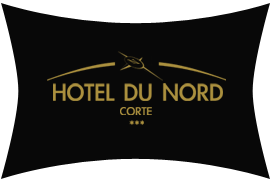 Located in the heart of Corsica, the Hôtel du Nord is renowned for being a charming hotel dating back to 1833. It is one of the oldest buildings in Corte. The hotel is not far from your favourite touristic destinations, Propriano, Calvi, L' Île-Rousse, etc.